As a Toronto wedding photographer, also travel to surrounding cities such as Hamilton, Cambridge, Waterloo and London, not to mention Montréal Ottawa and even destinations abroad. 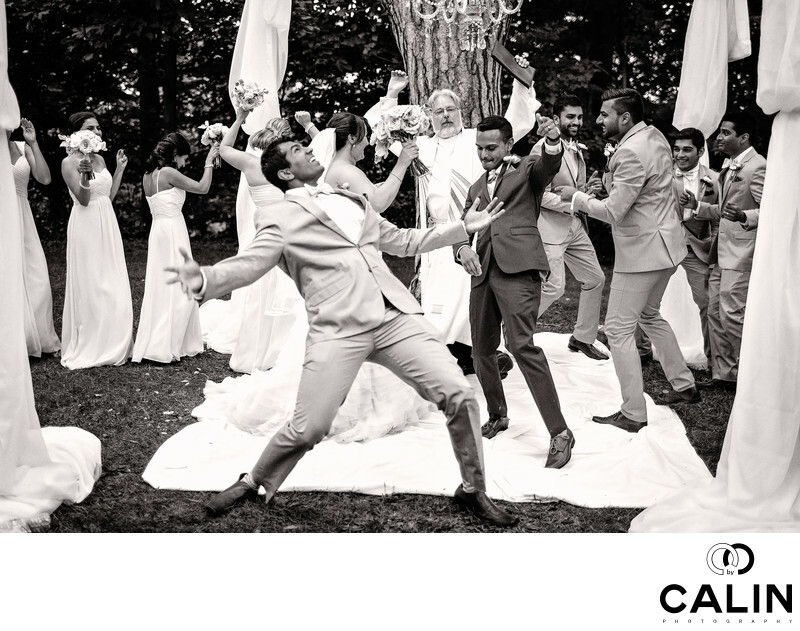 Not too long ago I was photographing a fusion marriage at Windermere Manor in London and I had to experience probably the funniest wedding idea. The bride is Christian and the groom Hindu. After the traditional Hindu religious ceremony the bridal party went to change clothes and prepared for the christian ceremony. During the break I had a chat with the priest and I thought I caught a naughty smile on his lips. I dismissed it quickly as I was busy running around taking photos of the guests enjoying the break by mixing a few drinks. Afterwards, I went and photographed the bride getting ready in her white gown and taking some shots the bride confessed she loved, mainly candid photos of her maid of honour and bridesmaids. Also, myself and my second photographer took some macro images of the bouquet, rings, garter, shoes and other wedding elements. We were pressed for time and as it usually happens, the wedding was running late, so we left the bride alone with the makeup artists and hair stylists and went to photograph the boys. I have to admit the groomsmen were having a great day and gave us some really great pictures opportunities. They were making funny faces, joking all the time and teasing the groom, which kept the atmosphere relaxed. When I saw the groomsmen and groom strolling relaxed, with the hands in their pockets, I had a feeling something was up. The religious ceremony was going normally and i knew it would be short and sweet. Nothing and nobody prepared me for what it would happen next. At one moment in time, the ceremony stopped and the DJ started playing some hip hop songs. I started laughing as I thought he just made a huge mistake; after all, a nuptial song is usually played at a wedding and I thought the DJ just clicked the wrong button. Suddenly, the bridal party started dancing, accompanied by the priest! Yes, you read that right!!! The priest was dancing. Oh, My God, I was thinking! This is awesome. The hip hop tunes were sending a contagious energy through the crowd and soon enough, most of the people started to dance, laugh and chat. It is not everyday that a photographer sees people dancing during the wedding ceremony, let alone a priest dancing on hip hop tunes. That was a big surprise the bride and groom kept secret from everybody except for the bridal party. I always try to find out if there are any surprises of which I should be aware and I am usually told a few days before (so I can not share the secret and spoil the surprise), but in this case, nobody did, which in fact, made things even better as I enjoyed the surprise myself. To document this image I used a 24 to 70 mm lens shot at 24 mm which allowed me to capture the whole scene. In post processing, to preserve the candid photography feel of this picture, I applied a will black and white filter. Location: 200 Collip Circle, London, ON N6G 4X8.